In a recent blog post I touched upon the subject of the similarity between the small-plants containers and the central rosette's towers. This has obviously been noted before, but I haven't read any proposed solutions for it yet. Does anyone have an idea? RE: Resemblance between central rosette's "towers" and small-plants' "containers". Do you honestly think, somebody noticed that? You are not allowed to view links. Register or Login to view. (07-06-2017, 01:58 PM)Davidsch Wrote: You are not allowed to view links. Register or Login to view. Do you honestly think, nobody noticed that? You are not allowed to view links. Register or Login to view. What I was hoping for is not an explanation for the shape of the objects, but rather a proposed solution for the similarity between the containers and the towers. ok. fair enough, so I changed it into: Do you honestly think, somebody noticed that? You are not allowed to view links. Register or Login to view. Sorry you are right, discussion of a possible solution is You are not allowed to view links. Register or Login to view. Yes, long since noted, but I don't want to say what I think they represent. It would give something away I've been keeping in my back pocket. But if you guys think we, here at Europe, have no other information sources, you underestimate us. (07-06-2017, 05:10 PM)Davidsch Wrote: You are not allowed to view links. Register or Login to view. ... discussion of a possible solution is You are not allowed to view links. Register or Login to view. The idea that the jars might represent the elements is interesting. Of course, a major difficulty is that six elements is a strange number. Four is normal, five appears sometimes, but six seems difficult to explain. The four elements are represented as jars (and personifications) in this engraving from Viridarium chymicum, 1624. I am not aware of earlier examples, but I guess they likely exist. 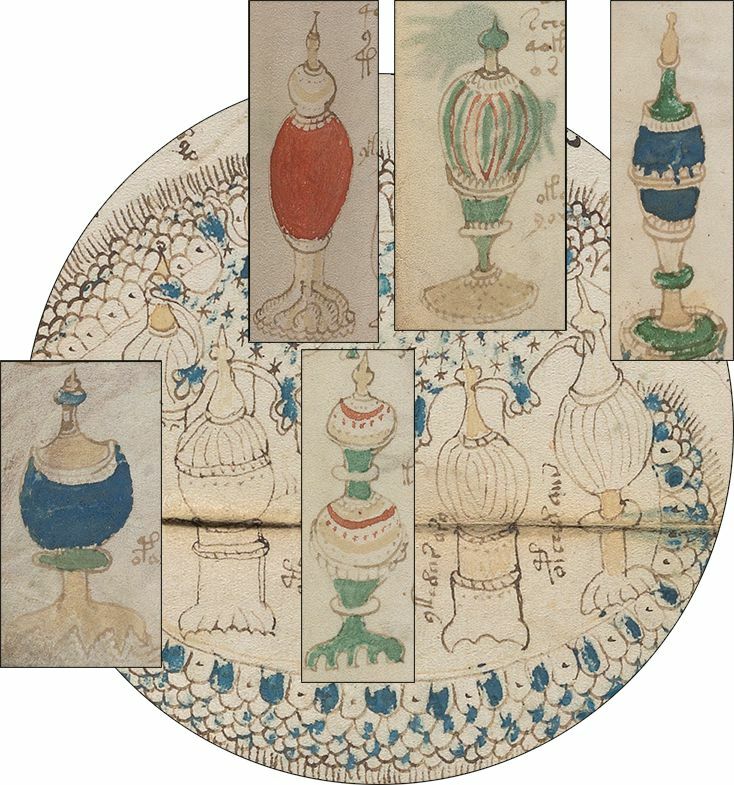 In one version of the Ripley scroll (Bodleian MS Ash Roll 53), there is a structure which presents striking similarities to the central rosette. 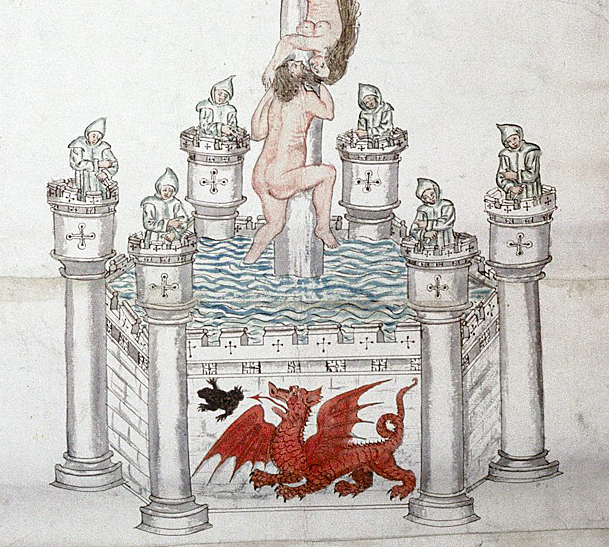 There are no jars in this one, but in many versions of the scroll, the figures atop the towers are holding flasks. Interestingly this particular version was discussed in a 2016 talk by none other than Alexandra Marraccini. Unfortunately, the date of this version is 1600. Still, I think it is a relevant parallel, because the number of "towers" varies regularly (4, 6, or 7) in different versions, so if this is the basis for the Voynich image, it could be based on an early version I don't know about.